People new to playing Omaha poker are prone to making a large number of mistakes. These include selecting the wrong starting hands, over-valuing hands on the flop, and bluffing too much. This article lists 10 of the most common mistakes make by new Omaha poker players. Players used to Texas Holdem tend to overvalue high card hands and undervalue those hands which have lower cards working together. For example Q-Q-2-7 of 4 suits is not a strong hand in Omaha poker. You will only usually continue if a queen hits the flop â€“ and even then other broadway cards can give opponents wrap straight draws. Conversely hands like 3-4-5-6 are stronger than new players think. These hands can make small straights on boards where opponents are less likely to have connected. New Omaha players often continue to over-value high cards during post flop play. An unimproved pair of aces is a great hand to semi-bluff raise with in Omaha, however if you are called (especially in more than one place) and the turn card completes a draw then they should often be mucked. Aces are a great starting hand in Omaha poker â€“ yet no other hand loses inexperienced players more money. Many players new to Omaha only ever raise with high-pairs. In a pot-limit betting game this not only tips off opponents as to the strength of their holdings â€“ it offers fantastic odds to those same opponents to play their hands. An extreme is a player who only ever raises with aces, here people with a range of holdings will call the small bet pre-flop â€“ safe in the knowledge that if they hit the flop hard they have the potential to win the original raisers entire stack. Draws in Omaha poker should be to the nuts (or very close to it). With multiple opponents with 4 hole-cards it is likely that someone has a nut draw. Attempting to draw to a non-nut hand can cost a lot of chips when you find out that making the hand leaves you second best. Position is more important in Omaha poker than many other games. The common pot-limit betting format means that hands are likely to be decided over several streets. A player who raises from good position can get to see opponents reactions before they act a number of times. Conversely, raising out of position often leaves you in a difficult spot and should be avoided with all but the strongest pre-flop holdings. Because of the 4 hole-card holdings it is very likely that one or more of your opponents has hit the flop hard enough to continue. This makes bluffing less effective in Omaha compared to other forms of poker. Instead semi-bluffing increases in value â€“ it is common to see a strong draw re-raise a strong made hand and vice versa. 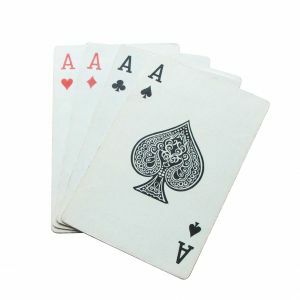 Kill cards in Omaha poker are cards that allow someone with a made hand (usually trips) to redraw against someone chasing a flush or a straight. Since trips is a common holding new Omaha players need to account for these when drawing to a flush. Someone with trips on the flop has 7 full-house outs on the turn and 10 on the river, these should be counted when comparing the pot-odds to the chances of making your flush. Omaha tends to play "bigger" than Texas Holdem at the same stakes. The number of starting hands played and combinations of draws mean that the average pot size tends to be larger than in other forms of poker. A rule of thumb used here is that you start Omaha at half of the stakes played in Holdem for the same pot sizes. The closeness of starting hand values means that there are often big swings in Omaha poker. Make sure you start at the right stakes to cope with this. Missing an unlikely gut shot straight draw in Texas Holdem is unlikely to be a big error. The chances of opponents having the exact holding required are very low. In Omaha such an error could turn out to be very expensive indeed. New players need to ensure that all possible combinations are covered on each board â€“ and that draws to the nuts are identified quickly. There are situations in Omaha poker where you flop the nuts but should still fold. These are cases where you have 2 or more opponents drawing to better hands. For example you flop an obvious middle straight on a 2-diamond board and have no redraws or diamonds yourself. You bet the pot, one opponent raises another re-raises and yet another calls. The chances of your straight being the best hand at showdown are tiny against trips, a flush draw and a wrap to a higher straight draw â€“ fold and wait for a better opportunity.